Sahara is a 2005 action film starring Penelope Cruz and some guys (50K JPEG), and the photos we originally had on this page came from a QuickTime trailer on the cross-promotional website for the movie and the DaimlerChrysler Sahara Limited Edition Rubicon Wrangler Unlimited. Turns out most of those shots didn't actually appear in the movie itself. 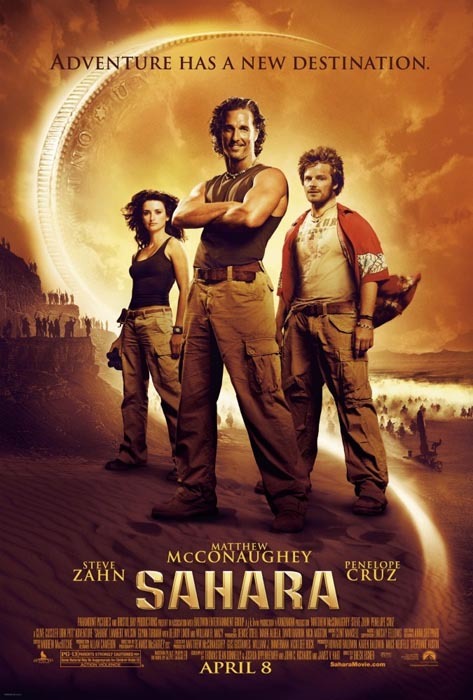 Ed Freniere saw the film shortly after it was released, and said, "This is a formulaic but entertaining (especially for Jeep nuts) action-adventure movie set in contemporary Africa, more or less in the style of Indiana Jones. Early scenes feature a Grand Cherokee. Soon after we see a full-size Cherokee (70's vintage) teamed with a Comanche pickup. They are subsequently destroyed. Next we see a brand new Wrangler Unlimited. Also, a very brief cameo of a 3B, old-looking and beat up. There may have been an MB or early CJ in there, too." A close look at the film reveals that what Ed glimpsed in the background of one shot is actually an M151 MUTT. We don't have a picture of that one, but the frame enlargements from Sahara below reveal a few other details of the Jeeps, such as the Comanche's missing hood. Click any frame to see a larger version (40K JPEGs). There was a marketing tie-in with Daimler-Chrysler who were selling a Sahara Limited Edition version of the TJ Unlimited. But for us maybe the most interesting long-wheelbase Jeep in the film is the stretched CJ-3B. Probably a French or Spanish-built version -- we only see it clearly in the one shot (above). See also Jeeps in the Spanish Sahara on CJ3B.info.